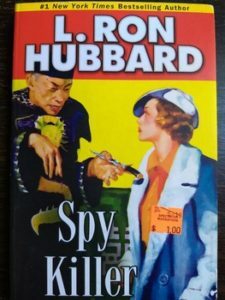 It’s time…for us to take on one of the pale male faces surely adorning everyone’s Bad Book Rushmore, but for complicated reasons we explain at no little length, we enjoy or anyway endure one of L. Ron Hubbard’s lesser-known book-like objects, a…collection of described events entitled Spy Killer. Short story shorter: this old Hubbard? It’s a real mother. “The Second Best Secret Agent in the Whole Wide World” by Sammy Davis Jr.